We’d love your help. Let us know what’s wrong with this preview of Fairday Morrow and the Talking Library by Jessica Haight. Eleven-year-old Fairday Morrow had no clue that moving from Manhattan to the small town of Ashpot, Connecticut, would lead to an unsolved mystery. Her parents’ dream of renovating a crumbling Victorian, called the Begonia House, into a bed and breakfast had seemed like treachery at the time. But Fairday found out that her new house kept secrets, and once inside its twisted Eleven-year-old Fairday Morrow had no clue that moving from Manhattan to the small town of Ashpot, Connecticut, would lead to an unsolved mystery. Her parents’ dream of renovating a crumbling Victorian, called the Begonia House, into a bed and breakfast had seemed like treachery at the time. But Fairday found out that her new house kept secrets, and once inside its twisted front gates, anything was possible. To ask other readers questions about Fairday Morrow and the Talking Library, please sign up. If you love riddles, you will absolutely enjoy Fairday Morrow and the Talking Library. The second in the Fairday Morrow series, Fairday and her Detective Mystery Squad jump right into their next mystery. Fairday, along with her mom, dad and two-year-old sister, Margo, moved from Manhattan to Ashpot, Connecticut, to open a Bed & Breakfast in a creepy, old Victorian house. Unraveling clues and solving mysteries are second nature to Fairday, and the Begonia House is full of secrets waiting to be If you love riddles, you will absolutely enjoy Fairday Morrow and the Talking Library. The second in the Fairday Morrow series, Fairday and her Detective Mystery Squad jump right into their next mystery. Fairday, along with her mom, dad and two-year-old sister, Margo, moved from Manhattan to Ashpot, Connecticut, to open a Bed & Breakfast in a creepy, old Victorian house. Unraveling clues and solving mysteries are second nature to Fairday, and the Begonia House is full of secrets waiting to be discovered. With a quick pace, Fairday's detective skills are put to the test. Picking up where the first book left off, Fairday's new home in the old Begonia House is unraveling more dark secrets. Words are mysteriously disappearing from books and time is running out. The Librarian of the Talking Library is in trouble and seeks the help of Fairday and her squad before books vanish forever. While Fairday's parents are still knee-deep in renovating the Begonia House into a Bed & Breakfast, the Detective Mystery Squad sets off to investigate. As they stumble into the mysterious library, the only way out is by solving the literary riddles. Things are not what they seem and new clues have them confused over who to trust. Will they be able to stop the Bookworm in time? Super fun mystery to read. Suspenseful without being too scary for middle-graders. I love the cover and the black and white illustrations are perfectly paired with the book. I definitely recommend starting with The Secret Files of Fairday Morrow so you don't miss a clue with this one. "Fairday Morrow woke to a loud crack of thunder." And that is how this book begins, with thunder, storm, and a willow barging in Fairday's home. Yep. The book starts with a bang! And the book stays exciting from the start to the finish. Sure, at times I was a bit confused, but that had more to do with me having a busy day and it being very late. The next day when I was awake I could get through this book way more easily. This time no scary ladies in mirrors, but words are being eaten by a bookworm "Fairday Morrow woke to a loud crack of thunder." This time no scary ladies in mirrors, but words are being eaten by a bookworm (ohhhh noeees! ), a library is in danger, there is a Halloween party (which is just perfect given the location), we also see Eldrich and Ruby again, and so much more. I just adore it when mysteries offer hints here and there but manage to keep the real whodunnit well hidden until the end. I didn't know who the bookworm was until it was revealed. Yes, I had some ideas, but nothing concrete yet. I loved finding out more about Fairday and her love for words. She even has a magical role that truly fits her like a glove. And we see her discover more about it and even use her newfound powers a few times (which made me smile so much). But Lizzy also gets some attention as we find out several things about her (most I already suspected). Yes, this girl doesn't only have the magical shoes, but so much more, and I am very happy with it, I can't wait to see what she will be able to do in the next book (or what we will find out in the next one). Marcus, well he is pretty much the odd one out it seems. He doesn't get anything special, and I also didn't always like him that much in this book. Mostly because his attitude towards Sanir and some other parts. Dif was also a surprise to me! I won't spoil anything of course, but I can't wait to see what will happen in the next book regarding what is said in the ending. I wasn't sure what I thought about the parallel world. I could get that there is a mirror world of the house. But that there is also a parallel world in the basement? It just seemed too much. Sure, I loved the library, and eventually I kind of liked the idea of a parallel world, but I still loved the parts that took place in Begonia House (normal/mirror) more. The book also has some illustrations spread throughout the book, and I am not too sure if I liked them. Yes, I liked that the book had illustrations, but I am not too sure about the style. All in all, I just want more of this series and I hope that there will be many more books in the future! The second book in the Fairday Morrow series has Fairday and her friends, Lizzy and Marcus, back to solve another Begonia House mystery. Fairday and her family live in the Begonia House, which her parents are repairing to open a B&B. In the first book, The Secret Files of Fairday Morrow, Fairday and her friends solve a paranormal mystery in the house involving a missing bride and a mysterious death. This second book brings forth a new paranormal mystery involving a cryptic librarian and a bo The second book in the Fairday Morrow series has Fairday and her friends, Lizzy and Marcus, back to solve another Begonia House mystery. Fairday and her family live in the Begonia House, which her parents are repairing to open a B&B. In the first book, The Secret Files of Fairday Morrow, Fairday and her friends solve a paranormal mystery in the house involving a missing bride and a mysterious death. This second book brings forth a new paranormal mystery involving a cryptic librarian and a bookworm. A fun middle grade book full of riddles and adventure. Confident and clever characters. The Begonia House continues to perplex the kids, who tackle solving the mysteries of the place. A quick and entertaining read for older kids. The first mystery of The Detective Mystery Squad (The Secret Files of Fairday Morrow) has been solved and now Fairway, and her best friends Lizzie and Marcus are looking forward to her first Halloween party at Begonia House, the old Victorian her parents are converting into a Bed and Breakfast. Then, one night a week before Halloween, during a wild thunderstorm, a branch of the old oak tree is blown through the window of Fairday’s bedroom. Before her dad moves her out because of broken glass, Fai The first mystery of The Detective Mystery Squad (The Secret Files of Fairday Morrow) has been solved and now Fairway, and her best friends Lizzie and Marcus are looking forward to her first Halloween party at Begonia House, the old Victorian her parents are converting into a Bed and Breakfast. "The Librarian has been double-crossed. Many words will be lost. Lest the bookworm goes away, story ink is how books pay. We seek the one who wears the shoes - only they can hear the news." What could it mean? Fairday can’t wait to talk it over with Lizzie and Marcus. But, just as they arrive so does a giant spider named Sanir, who can speak to Lizzie, and who leads them to a trap door in the closet under the stairs. Plunging into the darkness, the trio free fall through darkness, passing by three windows - one with curtains, a vase of red roses, and a silver spoon, a second with closed blinds and a ticking sound, and a third window with colored jars behind a broken window. What could that mean? Landing and finding more riddles which they are finally able to figure out, the friends meet Fas, the librarian for the Talking Library, a library where all the real first editions of all stories ever written are stored. It seems the Talking Library and Fas desperately need to get in touch with Eldrich, the Myxtress. It was she who tricked and cursed Ruby Begonia (see Book 1) so that when she was trapped in this part of Begonia House, she served as the Housekeeper for the Talking Library. Once the curse was broken and Ruby left, the stories in the Talking Library became vulnerable. Now, it seems the Library has a bookworm who is beginning to eat the words from the real first editions. The possibility that they could disappear forever looms unless this mystery is solved. In fact, Fairday had already noticed that in her prized copy of The Wizard of Oz, and in the copies of Charlotte’s Web in school, words were already missing and nobody noticed. Finding the bookworm sounds like no easy task, but the DMS are on the job. Can they find Eldrich and rid the Talking Library of this evil bookworm before books vanish forever? Fairday Morrow and the Talking Library is really a fun mystery to read with shades of Alice in Wonderland (in fact a discombobulated Alice even makes an appearance. The Begonia House seems to have an abundance of mysterious secrets that it is releasing one at a time. Interestingly, Fairday’s parents are totally unaware of the magical side of the house, despite all the renovations going on. And it turns out those sparkly red high heeled sneakers that fit Lizzie at the end of The Secret Files of Fairday Morrow play a pretty important role in this novel, too. Not only that, Lizzie is in for some surprises about her family that explains a lot. Besides an engrossing story with great plotting and interesting fleshed out characters, there are some fun full page black and white illustrations scattered throughout the story. 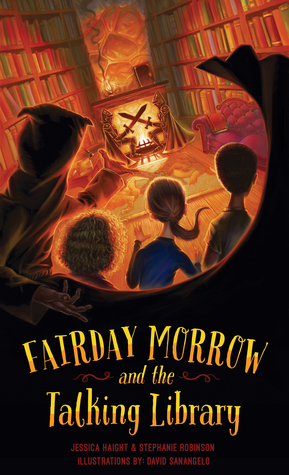 Fairday Morrow and the Talking Library will surely appeal to readers who like mysteries, character friendships, and, especially, solving riddles - there are lots of them. I can’t wait to read the third DMS mystery. This new Fairday adventure will appeal to kids (and grown ups!) who love stories with mystery, friendship, and puzzles. And what an imaginative adventure book two is! Fairday lives in a house with many surprises. She never knows what will happen next but she's up for the challenge. Fairday jumps into a new world within her own, along with her trusty sidekick friends, and meets fascinating new characters. It's a world of bookworms (who actually eat words!) and wordweavers (cool job!) where childre This new Fairday adventure will appeal to kids (and grown ups!) who love stories with mystery, friendship, and puzzles. And what an imaginative adventure book two is! Fairday lives in a house with many surprises. She never knows what will happen next but she's up for the challenge. Fairday jumps into a new world within her own, along with her trusty sidekick friends, and meets fascinating new characters. It's a world of bookworms (who actually eat words!) and wordweavers (cool job!) where children are needed to save books from disappearing. Books truly live and breathe in this story - literally! What a fun place to be where ink is alive and books can talk and you can enter stories and meet characters. There are so many magical concepts in this story to inspire kids to fall in love with reading - and words. Figuring out riddles is a big part of solving the mystery and it's fun to follow Fairday and friends in a race to solve them before books are lost. But not all is fun. They must beware of things that lurk in shadows and get their punctuation just right (love this!). This is Fairday's most complicated case to solve yet in a world where she does not know who to trust, so she must trust herself - and her friends - to survive. A softback Advanced Reading Copy. Whilst not adverse to reading books out of sequence, I'd suggest that this, the second in The Fairday Morrow Files, is best read after book one, The Secret DMS Files Of Fairday Morrow, and not just because it fills you in on previous events. As, creatively and intelligently written, its a great introduction to the 'crumbling, creepy old manor house and its residents. But onto this, the latest instalment, of which I hope there are many more to come. With its eye-cat A softback Advanced Reading Copy. With its eye-catching cover and a title that surely all bibliophiles will find hard to resist I'm pleased to say that this lived up to all of my expectations ... and then some. Like the stories of a certain boy wizard, this is a book that grown-ups should surely find every bit as magical as younger readers as they emerge themselves in a great mystery in which Fairday and friends race to solve puzzles before, words disappearing from books, its too late. Fast paced, suspenseful, wonderfully imaginative, outstounding illustrations and just the right side of spooky for its target audience of middle graders. If you thought you knew what a Book Worm was ... think again - or better still pick up a copy of Fairday Morrow And The Talking Library. Stephanie Robinson and Jessica Haight have created a satisfying sequel to the first book in the Fairday Morrow series. Once again, we return the the quaint town of Ashpot and follow Fairday, Marcus, and Lizzy (the DMS) as they solve a puzzling, paranormal mystery. The secrets of the Begonia House deepen and the DMS discover the Talking Library. Bravo to the authors for creating such a cool library with poisonous punctuation--brilliant! Loved the uniqueness of the world building there. I was fasc Stephanie Robinson and Jessica Haight have created a satisfying sequel to the first book in the Fairday Morrow series. Once again, we return the the quaint town of Ashpot and follow Fairday, Marcus, and Lizzy (the DMS) as they solve a puzzling, paranormal mystery. The secrets of the Begonia House deepen and the DMS discover the Talking Library. Bravo to the authors for creating such a cool library with poisonous punctuation--brilliant! Loved the uniqueness of the world building there. I was fascinated by the way books could come to life in the Talking Library. So cool! Fairday and her friends are tasked by the Librarian with finding Eldrich to help deal with the bookworm who is slowly destroying the original copies of stories by ingesting words from them. Nothing is what is seems making this fast read a definite page turner. I really enjoyed the book. It started out a little fast but it all made sense as you keep reading. I recommend reading the books back to back as this book refers to the first often. There are many new characters introduced in this book but the DMS remain my favorites! If you love reading and love books, you will enjoy this book! As with book one, this story was a fast and easy read. I wish I could say that I loved this book, but oh, I did not. I feel a little disappointed about it. It just ended up not being a book for me. Aw. I'm giving this one two stars, and I will try my best to mention most of my reasons for why I'm giving it that. It was a pretty short book, and fast to read. I think that the main reason for why I had issues with this book was the writing. I didn't connect with the characters at all. And I found it As with book one, this story was a fast and easy read. I wish I could say that I loved this book, but oh, I did not. I feel a little disappointed about it. It just ended up not being a book for me. Aw. I'm giving this one two stars, and I will try my best to mention most of my reasons for why I'm giving it that. It was a pretty short book, and fast to read. I think that the main reason for why I had issues with this book was the writing. I didn't connect with the characters at all. And I found it all to be so boring. Which is a depressing thing to feel when reading a middle grade mystery book. I didn't like that just about every time Lizzy spoke, she only spoke the same words all the time. Annoying. Fairday Morrow and the Talking Library takes place just one week after book one. Can't help but mention that I wish it had taken place a bit later than that, as I feel like Fairday and Lizzie still hadn't had a chance to get to know Marcus at all. Yet they are now supposed to be best friends. I sadly didn't feel any of these friendships. They did not really talk together or really do anything. Sure, they are solving a new mystery, but it was not exciting to read about for me. I really wish I had felt their friendship more, because if I had loved their relationship together, I think I would have loved this book too. But I did not. Sigh. One thing I really did love about the book, though, was Fairday's dog, Auntie Em. She was adorable. Sadly didn't think her family was interesting, though. A bit depressing. I'm not sure what I wish to share about this book. I don't think I will write too much about this book at the moment. Simply because it was pretty fast to read, and I didn't feel like much happened, so there really isn't much I can share about it. I'm giving it two stars because while I did not like this book, I also did not hate it. It wasn't horrible. I liked some parts of the story, like Fairday's cute dog. And her house was a bit interesting too. But sadly, for the most part, I kind of disliked all of it. Found it to be boring. Not exciting. Will talk a little bit about the story in this book. Fairday and her two friends are finding clues about a new mystery in her house. Words from famous books have gone missing. They end up finding a secret place, where they find the Talking Library. Where they learn that there is a bookworm on the loose, eating words from books. I wish I could say that it was exciting to read about, but I didn't think so at all. The writing kept me from being engaged in the story and the characters. I do wish, though, that I had enjoyed it a bit more. Overall, I am glad that I decided to give these two books a chance. As I do adore the authors, and I have followed their blog for years. They are both adorable, and I love their riddle blog posts. They are always so much fun. Sadly, though, this book just was not for me. I didn't hate it, but I also didn't like it much at all. I do think that a lot of other people might end up loving this book, but for me it just wasn't possible. I liked the drawings inside the book, though they were a lot different from book one. Still, both were pretty. Pick up a copy o this mystery full of riddles and adventures as three young friends follow the clues in a house where anything is possible. My copy was a gift through Goodreads First Reads. From the very beginning we are on an adventure with Fairday, Lizzie, and Marcus, the DMS (Detective Mystery Squad) to discover the meaning of notes written in riddles about words being lost and a bookworm and something about shoes that Fairday ke Have you ever met a bookworm that eats words in a book? If not, now is your chance. Pick up a copy of FAIRDAY MORROW AND THE TALKING LIBRARY by Authors Jessica Haight and Stephanie Robinson and help Fairday and friends solve the mystery of Begonia House. I have been waiting for the second installment in this series forever and it did not disappoint. This book kept me on the edge of my seat until the very end. Cannot wait for the next book! Thanks to @kidlitexchange for providing me with this copy for review. This is a great mystery book for middle graders that reminds me a little of the Nancy Drew books I read growing up. I have always loved a good mystery to solve and Fairday, Lizzy, and Marcus (the Detective Mystery Squad aka DMS) definitely do a great job solving this one. I absolutely loved the whole taking library concept and the bookworm that was eating the words out of stories. Fairday’s house seems so intriguing and I would love to experience a house like it in real life. This book was a wonderful little escape from reality and I think any middle grader would thoroughly enjoy it! This new Fairday Morrow adventure not only tested the DMS but it also changed them greatly. I love the little hints about greater things to come the characters ways that we're dropped through out. I do have to point out that this book was definitely more about solving riddles and a mystery than being spooky but I still enjoyed it a lot. I really hope there will be a new adventure for the three detectives in the future. Fairday Morrow and the Talking Library is an exciting, fast moving story that proves anything is possible! Just when you think you've solved the mystery, a new clue proves otherwise, I loved this book just as much - if n0t more than - as The Secret Files of Fairday Morrow, and I'm sure other readers will feel the same! This is a modern day Alice in Wonderland kind of story with a fantastic DMS twist! I thoroughly enjoyed reading the second book from such clever and talented writers! From page one, I was immediately lost in the adventure and could not put it down. I love that the door seems open for a book 3! I loved this book. It is the next adventure/mystery (following "The Secret Files of Fairday Morrow") for the DMS kids to solve. For anyone who likes reading or wants to propel their children into the exciting world of books, there is no better story to read than this one. The story brings libraries, the written word, grammar, and various objects to life for every reader of all ages to enjoy. For more seasoned readers, this book will bring you pleasantly back to your youth where imagination was f I loved this book. It is the next adventure/mystery (following "The Secret Files of Fairday Morrow") for the DMS kids to solve. For anyone who likes reading or wants to propel their children into the exciting world of books, there is no better story to read than this one. The story brings libraries, the written word, grammar, and various objects to life for every reader of all ages to enjoy. For more seasoned readers, this book will bring you pleasantly back to your youth where imagination was fresh and boundless. FAIRDAY MORROW AND THE TALKING LIBRARY by Jessica Haight and Stephanie Robinson is the second book in the Fairday Morrow series. The plot immerses the reader in the ever-mysterious Begonia House, where Fairday resides with her parents and little sister. The house is currently under construction to become a bed and breakfast, but it is the many secret rooms that are of interest to Fairday and her friends, Lizzy and Marcus. In this second installment, the three sleuths team up to uncover the secre FAIRDAY MORROW AND THE TALKING LIBRARY by Jessica Haight and Stephanie Robinson is the second book in the Fairday Morrow series. The plot immerses the reader in the ever-mysterious Begonia House, where Fairday resides with her parents and little sister. The house is currently under construction to become a bed and breakfast, but it is the many secret rooms that are of interest to Fairday and her friends, Lizzy and Marcus. In this second installment, the three sleuths team up to uncover the secrets of the Talking Library, a repository of live books (yes -- the stories come to life, but I won't tell you how!) in jeopardy due to the underhanded workings of the Shadow Rook, sneaky punctuation, and a conniving bookworm. Fairday must lead the way to solve the mystery before the books are lost forever. In this second book of the Fairday Morrow Series, eleven-year-old Fairday Morrow and her friends (the DMS squad) have to figure out why words are suddenly missing from their favorite stories. The search takes them deep into the walls of the mysterious Begonia House where they discover the Talking Library. Using their riddle-solving skills, they must discover the identity of the bookworm who has been eating the words and stop more books from being altered. The Talking Library is a very imaginative In this second book of the Fairday Morrow Series, eleven-year-old Fairday Morrow and her friends (the DMS squad) have to figure out why words are suddenly missing from their favorite stories. The search takes them deep into the walls of the mysterious Begonia House where they discover the Talking Library. Using their riddle-solving skills, they must discover the identity of the bookworm who has been eating the words and stop more books from being altered. The characters kept me very involved in the story. I was intrigued with their detective skills and how they analyzed what was going on around them. I loved the way the characters all worked together to solve the mystery and this showed how important friendships are. It held my interest all the way through and I look forward to the next journey that these detectives will be on. Beautiful illustrations as well. Jessica is a true New Englander, with a deep desire to be near the ocean and a love of the four seasons. She enjoys drawing while standing up and cultivating magic in her garden. She easily floats away in the pages of a good story and is still waiting for her owl from Hogwarts. Jessica lives in Connecticut with her charming fiancé, James.